With the close of COP-17, parties to the UNFCCC maintained the same inadequate emissions reduction pledges, thus committing the world to a more costly and risky path forward than is needed given the immediate availability of cost-effective measures to reduce emissions and begin the transition to a low-carbon economy. As our previous analysis showed, postponing the adoption of more ambitious targets until after 2020 would commit countries to rates of CO2 emissions reductions after 2020 far larger than what has been seen either historically or in energy system model projections. By failing to agree to a mechanism to increase the ambition of mitigation targets before 2020, the decisions made at COP-17 place unnecessary burdens on future generations who will have to work much harder and endure much greater costs and risks as a result of these decisions. Without new pledges for emissions reduction on the table, our Climate Scoreboard analysis projects future global temperature increases far above the global goal of 2°C (3.6 °F) , pointing towards temperature increase of 4.3°C (2.6 – 6.9°C) or 7.7°F (4.6 – 12.3°F) by the end of the century. Even though countries were unable to agree to increase the ambition of 2020 pledges, many cost effective mitigation opportunities exist today; and the costs will fall as low-carbon, efficient technologies develop and scale. Commitments lacking the necessary ambition delay these cost reductions and the maturation of the technologies needed to make a sustainable, low-carbon economy a reality. The longer the delay in implementing significant emissions reductions, the faster emissions must fall later to limit expected temperature increase to 2°C (3.6 °F). Such rapid emissions reductions cost more and lead to more economic disruption, thereby reducing the chances that future generations would follow through with such large emissions reductions. More ambitious action by 2020 would reduce the rates of reduction needed in later decades, increasing the chances of limiting warming to the 2°C goal. 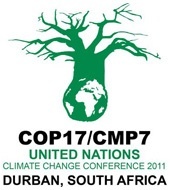 Yet, in Durban, delegates failed to agree to increase the amount of greenhouse gas emissions cuts. Delegates did agree to continue to work towards addressing climate change via international legal agreement (rather than relying only on voluntary action). This is a step forward, given that climate change is a classic, “Tragedy of the Commons” problem with the atmosphere as a shared global commons. As systems analysis has shown for decades, fundamental solutions to The Tragedy of the Commons require agreements that include all of the major participants in the commons. Since the breakdown of the UNFCCC talks in Copenhagen, the world has lacked such a forum for the climate change issue. Thus, the establishment of the new body to negotiate a global agreement – the Ad Hoc Working Group on the Durban Platform for Enhanced Action- provides a venue for the steps that the world’s nations need to take.